Facebook has become an integral part of lives, whether we admit it or not. With smart phones, it’s now even easier to update our friends through the Facebook mobile app. One cool feature of Facebook for mobile is being able to sync your Facebook friends to your phone’s contact list. It’s something that the Facebook mobile app asks when you first install it – whether to sync all Facebook friends, or only those who are already in your phone book. Open your Facebook app and press the Menu key. Go to Settings>Sync Contacts. 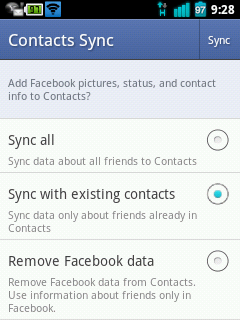 Sync all adds all your Facebook friend to your Contacts, regardless if they are already listed or not. This means if you have 500 friends in Facebook, you’ll have the same amount (plus existing contacts) of people in your phone book. If you want to do this, make sure you have enough room in your phone. Sync with existing contacts only adds those friends who are already on your Contacts. This option is better, saving space and retaining only those friends that you keep in touch with on a regular basis. Remove Facebook data unlinks your Contacts app from your Facebook, keeping them separate – if you prefer not to use the Facebook sync feature. Why do you need Facebook sync? It’s not a huge necessity, really. But the Facebook sync option is fun to use if you want your friends’ profile photos to appear on your Contacts – or any messaging app you use for SMS. It’s definitely a personalized touch rather than seeing a generic avatar beside your friend’s name. This is also useful if you want to get the contact info of Facebook friends who are not yet on your Contacts. This makes the process of exchanging contact info easier and faster. You don’t have to message your friend to ask for his/her number – if it’s already in his/her Facebook page. So there you go – another useful feature from the Facebook mobile app. If you’re not happy with the results, you can always go back to the first two steps mentioned on this article and select Remove Facebook data instead. You can always go back and change these settings at a later time should you change your mind.